Diamond Halo Vintage Engagement Ring | Shane Co.
As part of our exclusive Couture by Shane Co. collection, this engagement ring radiates beauty with 98 round diamonds, at approximately 1.50 carats total weight, creating a stunning backdrop to the center diamond of your choice. Each diamond has been hand-selected for superior brilliance and is pavé-set in quality 14 karat white gold with a vintage-inspired milgrain detailing to complete the design. 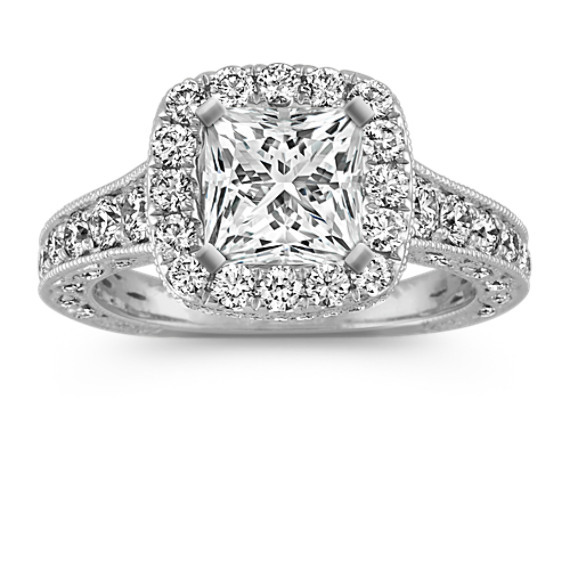 Popular choices of center 1.50 carat diamonds to complete this halo setting include round, princess cut, and cushion cut. I am in love with my engagement ring!!! My fiance proposed to me 7 weeks ago and I am totally in love with my ring!!! Looks beautiful on my ringer!! !